Apple looks to have quietly updated the troubled Mac OS X 10.7.3 Updater, first noticed by several of our readers and confirmed by OSXDaily. No official change was announced and there is no revised version number provided by Apple’s Support page, but presumably the new build addresses any potential installation problems or CUI errors that occurred for some users with the original release of OS X 10.7.3 earlier this week. Apple has updated the SHA1 on the combo updaters support page to reflect the change, and they are also now redirecting download links from the original OS X 10.7.3 Client Updater to the revised OS X 10.7.3 Combo Updater. There are also mixed reports that installing from the new Combo Updater changes the OS X 10.7.3 build number fro 11D50 to 11D50b on some Macs. This does not appear to be the case on all Macs though, and some retain the 11D50 build even when the new update has been used, suggesting the original installation issues and CUI errors may have only impacted certain Mac models to begin with. If you updated to 10.7.3 without any problems, you likely do not need to download the new version. If you held off on the OS X 10.7.3 Update due to the reported problems, you are probably safe to update now, although you should perform a Time Machine backup before proceeding just in case. How can I tell which version I have downloaded with the SHA1? I haven’t installed the update yet but I will download it again to be safe. Please note that I started the upgrade at home, but the download would take ages, so I stopped it and finished it 10 hours later at work. I did not have any issues. If no problems were experienced with the initial combo update would there be any value to re-download the most current version? No it’s probably not needed. The problems only effected a small amount of users with certain Macs, so if you are trouble free there is no need to bother. Did the update Thursday Night, horrible so far, apps are timing out, will not come out of sleep, it is resembling Windows XP more and more as the days pass. Haha, march, keep on dreaming. Ivy Bridge is not due until april/may, so new MacBook Pros most likely are not released until then. I haven’t updated to OS X 10.7.3 yet, but attempting to run Software Update crashes the application repeatedly. LOL. I had updated my system and since after that i have not been able to anything on it. i can’t even re-install lion on my MBP. Everything crashes before it starts can’t even open finder. Hope someone can help !! I downloaded “OS X Lion 10.7.3 (Client)” directly from http://support.apple.com/downloads/ (997 Mb, may I call it ‘delta’?) two days ago and installed it on my MBP 13 mid-2011. I’ve found no problems at all and no improvements neither!. My internet got many bugs while browsing on safari. The pages sometimes stucks while loading. Only way to get the page opened was to deactivate the WIFI and open again. Even an ethernet connection couldn’t help stopping the problem of loading of a white site (stucks while loading). Not always but in an hour of surfing more than 20 times. Every 7th page approximately very annoying. This all after the update in the first hour of publishing the 10.7.3 update. My mac is a Macbook Pro 13 Early 2011 (4GB). The additional link now with the combo client did fix that. My new version changed to 11D50b. No space loops and no CUI problems detected before. Only the internet safari bug. Can anyone confirm, that the Lion installer (Install Mac OS X.app from App Store) has been updated as well? Can’t verify this directly without downloading it, but presumably it has been updated to Combo as well. 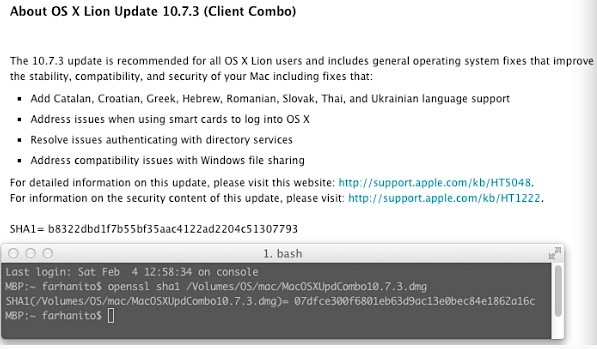 It would appear that the Lion Installer (Install Mac OS X Lion) has been updated. It is now at version 1.0.16 and is 4.07 GB. The earlier one was version 1.04 and was 3.76 GB. If you look at the InstallESD.dmg, there are an additional 8 packages for the new language resources. InstallESD.dmg MD5 & SHA1 matches the posted. It seems the main installer is not updated (yet). i run shasum on the combo installer and everytime i get a different checksum. Whoot? 13″ MBP mid-2010 model. I had the CUI and random panic crashes after doing the standard update to 10.7.3. Just did the combo update, and I see my build version changed to 11D50b (it did not have the b on it when I looked before installing the combo over the standard version). Hi – I only had my macbook pro since december, but I must say that I have never or rather not with the newer windows versions experienced these kinds of errors updating the windows OS. Come on Apple how hard can it be !!! Hi there Mac OSX users the update is only specifically to Mac’s that came with Lion from factory. Yes, it does fix problems with the installer, Safari (PHP, Apache), etc. Mac’s originally running 10.6 or below, in other words, 200x>2010, will not experience any difference. applied this new combo update. My build number went from 11D50b to 11D50d. The original update was signed with a certificate that expired on March 23, 2012. The current update has certificate is dated October 24, 2019. Apple download page does not show the SHA1 checksum for the 10.11.4 combo update file. Is there anyway to check it?